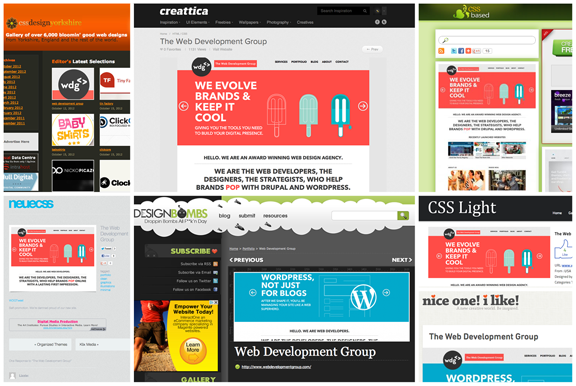 webdevelopmentgroup.com reaches new heights on design galleries! After The Web Development Group finished their rebranding we were eager to receive feedback from our different audience members. Previous and current clients raved about the new site, and a few offered some constructive criticism. Of course, this is the audience group we care most about pleasing. If our site is appealing and easy to navigate for current and past clients then chances are it will be just as helpful to future and prospective clients. That being said, we were also eager to see how our peers in the design and development world would receive the new web design. They, after all, are able to look at webdevelopmentgroup.com and fully recognize the amount of time, energy, and work that went into making it such a great site. Aside from asking our colleagues their opinions on the new website, we decided to submit our website to a few design galleries. This, we felt, would really shed light on how impressive the WDG rebrand was. We were overwhelmingly happy with the positive response we received from different design galleries. We have now been featured on over ten sites that give other designers and developers inspiration for their projects. We have always had the utmost confidence in our skills as a top design and development firm, but now we know that the design and development community also recognizes our ability to produce top-notch work. At The Web Development Group we build websites that are engaging, user-friendly, and feature the most modern WordPress plugins or Drupal modules. As a top Virginia web development company, we build awesome sites for clients based in MD, NC, VA, and DC. Although our redesign project was on WordPress we have also gained a reputation as a top Drupal company. If you are interested in getting a redesign, reach out to us! We would love to talk you through the process and help you come up with the solution that is right for you and your brand.